Torque to yield bolts, also commonly referred to as angle torque or stretch bolts, are used in many of today�s modern engines, predominantly for cylinder head bolts but also main bearing caps. Torque to yield bolts, also commonly referred to as angle torque or stretch bolts, are used in many of today�s modern engines, predominantly for cylinder head bolts but also main bearing caps. Engines designed utilising torque to yield (TTY) heads bolts require fewer head bolts to achieve the desired clamping loads than those of conventional bolts. With fewer bolts the engine manufacturer has more flexibility in the cylinder head and block design as well as reducing the cost of the engine. While torque to yield head bolts are attractive to the engine manufacturer there are disadvantages to the engine repairer of which we all need to be aware. For most of us it would be unthinkable to replace a conventional head bolt unless the bolt was damaged: i.e. stripping threads, the bolt head was rounded off, the shank was severely corroded or pitted. Conventional head bolts simply just did not wear out. Torque to yield head bolts however, by the very nature of their design do wear out and should never be reused. Under the application of load, all bolts exhibit four main phases: the elastic phase, the plastic phase, the yield point and the shear point. In the elastic phase, a bolt will stretch under tension but return to its original length when the load is removed. As we continue to apply load the bolt reaches the plastic phase, from which it can no longer recover to its original length and is now permanently stretched. The point that separates the elastic phase from the plastic phase is called the yield point of the bolt. Finally we will continue to apply load, the shear point is reached and the bolt material wastes and breaks. Conventional head bolts are tightened in a series of stages and in a sequence to a predetermined torque setting. Given any set of bolts, each will be tightened to a slightly different loading as the torque wrench simply clicks off when the set resistance level is reached. The applied tension is well within the elastic phase of the bolt: i.e. the bolt stretches under load and then returns to its original length when loosened. No allowances are made for variances, such as higher resistance due to friction or thread damage, in the applied load of individual bolts within the engine set. These variances and inaccuracies are well known by engine designers. Torque to yield head bolts are also tightened in a series of stages and in sequence, however they are not tightened to a predetermined torque, they are tightened through a series of specified angles. This data is provided by the engine manufacturer and should always be adhered to. While the first step in the tightening process is normally stated as a torque figure, it is done so only to provide a uniform baseline from which the true load is then applied. This is commonly referred to as a pre-load or snug torque. A typical tightening specification would look as follows.. This procedure ensures that friction does not cause an uneven bolt loading and that the correct high tension is achieved every time during assembly. It is essential that a quality wrench with an angle gauge be used to achieve the correct angles of turn of the tightening process. Unlike a conventional bolt, torque to yield head bolts are tightened beyond their elastic range, past their yield point: i.e. past the point from which the bolt material can recover to its original length: and into the plastic phase of the bolt material. The bolt is permanently stretched and for this reason should not be reused. 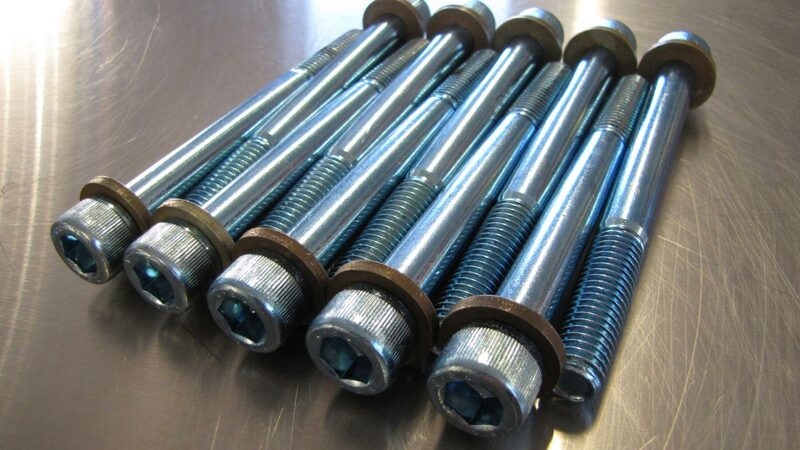 The reliability of these bolts once stretched is greatly reduced, if they are reused, they are permanently stretched further a second or third time. It is for this reason, you should never retorque a torque to yield head bolt. Some engine manufacturers provide a measurement within which a bolt may be reused however the age and history of the bolt is not taken into account. The bolt may well be within specification to pass a simple measurement test but the bolt could be very close to its shear point. Only one failed bolt can result in serious combustion leakage. The cost of a new set of torque to yield head bolts is well justified when compared to the costs of having to repair an engine for the second time because of insufficient clamping load due to bolt fatigue. There are a variety of factors that will shorten the service life of a head gasket, but lack of proper clamping load is certainly one of the leading contributors. Always clean up bolt hole threads with a bottoming tap, always apply a light coat of oil to the threads and bearing surfaces of the bolt and have your torque wrench checked and calibrated every 12 months. Remember that if the tightening sequence is specified in degrees then you are dealing with a torque to yield head bolt.